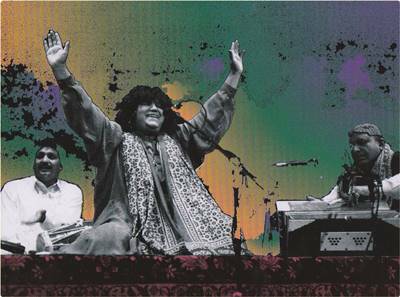 This evening I’m sending you a marvelous piece of Sufiana Kalam, performed live by the great Begum Abida Parveen in the USA in 1997. In this piece she sings two poems. The first poem is by the ecstatic Sindhi Sufi and poet Hazrat Sachal Sarmast (R.A.), who lived from 1750 to 1829. Like other great Sufis, e.g. Hazrat Shah Abdul-Latif Bhita’i (1690-1752), Hazrat Sachal Sarmast was extremely tolerant, he saw the same Truth in all religions, and intensely disliked religious formalism and the tyranny of the narrow-minded mullas. This is a translation of Hazrat Sachal Sarmast’s poem: Mahi Yaar Di Gharoli Bhardi. ** “Wali” literally means “one who is close [to God]”, i.e. “a friend of God”, “a Saint”. Turn, O Precious Spinning Wheel of the Lord! Long live the one who makes you spin! “There is no “I”, for all is “You”!